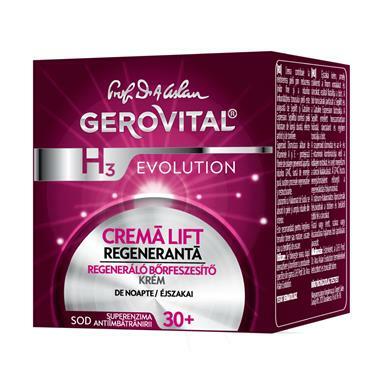 Regenerating Lifting Cream-Night care – 50 ml. The cream is an intense night-care regenerator. It contributes to the rejuvenation and remodelling of the skin, by decreasing the fine lines and wrinkles. The intense lifting effect is ensured by Sepilift and Gatuline Expression. Sepilift offers the skin long term moisturizing, anti-wrinkle and tonifying effects. The Superoxide Dismutase together with Vitamins A and E – protects the collagen fibres preventing the appearance of wrinkles. GP4G, a source of pure energy, sustains the regeneration and restructuring processes. The liposomes with Sodium Hyaluronate are being absorbed into the skin and fill in the wrinkles from within. Recommended for the care of dry skins or the ones which presentsa tendency for dryness, young or mature. Use the cream daily, in the evening, after completing the cleansing and tonifying processes. Apply on cleansed face neck and decolletage. Massage gently with circular movements to help the cream’s better absorption. Firm, wrinkle free, regenerated skin.